Divorced, beheaded, died, divorced, beheaded, survived, EXTENDED! 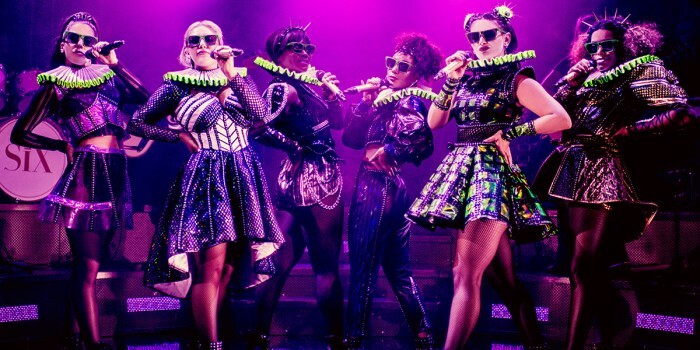 Those talented queens are going to be staying a little longer in the Arts Theatre, as Six The Musical gets an extended run to January 2020. Originally playing until the 5 May, and starting as just a 7-week run following success at last year’s Edinburgh Festival Fringe, these phenomenal divas are now staying in Theatreland for nearly a whole year! Six The Musical is a unique retelling of Henry VIII’s wives and their stories, as they battle to decide who had the toughest time with the infamous king. And because this is a musical, the battle is, of course, a battle of songs, as they all perform smash-hit solos, in the hope of winning the title and leading the all-female band into the finale. A concert-style show, Six remixes 500 years of her-storical heartbreak into a 75-minute celebration of 21st-century girl power. From Tudor Queens to Pop Princesses, these Queens may have green sleeves, but their lipstick is rebellious red! Returning to the stage to play the wives are, Jarneia Richard-Noel, Millie O’Connell, Natalie Paris, Alexia McIntosh, Aimie Atkinson, and Maiya Quansah-Breed, with Grace Mouat returning as the alternate Jane Seymour/Katherine Howard and Dance Captain. They will be joined by two new queens, Vicki Manser (alternate Anne Boleyn and Anna of Cleves), and Courtney Stapleton (alternate Catherine of Aragon and Catherine Parr). And the good news doesn’t stop there, as the Six The Musical Studio Album has been named Best UK Cast Recording in The Curtain Up Show Album of The Year Awards. Although this is probably no surprise to those who’ve downloaded the cast soundtrack, as it’s been streamed an incredible 4 million times. Seems like All You Wanna Do is singalong and Get Down with your favourite queens! 2019 is undeniably the year of the London Musical. Get yourself fully prepared for a year of West End must-sees by listening to their cast recordings. And it seems like good news really does come in threes, as dates for the first ever US production of Six The Musical have also been announced. The queens will be heading to the Chicago Shakespeare Theatre from 14 May –30 June this year. Six The Musical will now run from 17 January to 5 Jan 2020.